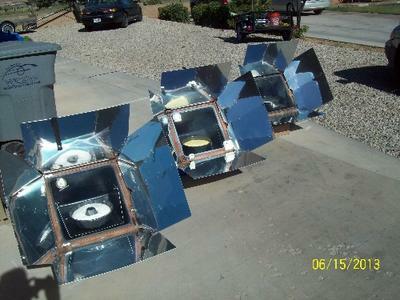 Today is Father's day and my wife has been wanting to do a Mango Cheesecake in the Sun Oven since the time we first tried it three years ago when Jackie Harsha first made five of them for a solar cooking demonstration she helped me with here in St. George, Utah. 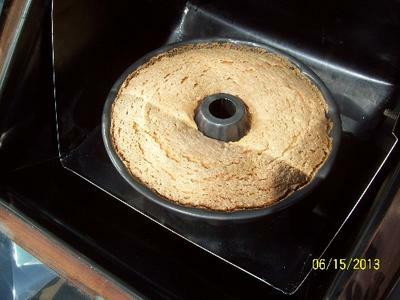 We have also wanted to try an Angel Food Cake in the Sun Ovens as well since it is the only cake/pastry that we have not cooked in a solar oven. We have never dared to try since an Angel Food Cake usually requires a higher sustained temperature than many other cakes. 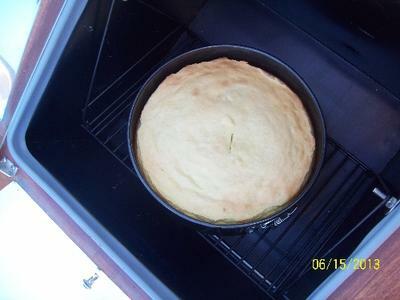 We set out our three Sun Ovens to preheat while we prepared the cake and cheesecake mixes. We then mixed up the Angel Food Cake batter and placed it in two separate, smaller dark pans, one of them a bunt cake pan and the other in one of the round roasters that we have. We did this because we had no dark colored traditional angel food cake mold and we did not want to risk using the shiny aluminum traditional angel food cake pan and possibly not achieving the results we wanted. So, dark pans; two of them, were what we chose to use. In the end, all of the cakes turned out very well. The Angel Food Cakes took about an hour, maybe just a little more, to cook with a nice golden brown crust and the Cheesecake took about an hour and a half since it was very thick and moisture heavy. Later this afternoon the scrubbed potatoes will be placed in the preheated Sun Ovens for baked potatoes and my boys will grill some marinated boneless pork ribs on the bbq grill (sorry, the only thing not solar cooked) and we will accompany all of this with a green salad and then cakes to finish off this excellent Solar Cooked Father's Day meal.